Be the first to share your favorite memory, photo or story of Daniel "Stet". This memorial page is dedicated for family, friends and future generations to celebrate the life of their loved one. 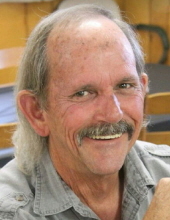 Daniel “Stet” Wayne Stoetzel, 65, of Knoxville, passed away Tuesday, January 15, 2019 at Park West Medical Center. He was born May 13, 1953 in Iowa, one of thirteen children born to Frank Clarence Stoetzel and Elaine Groppe Stoetzel. Daniel served with the US Navy during the Vietnam War era. He retired from the Y-12 National Security Complex where he worked as a security guard. Daniel was an avid dart player and a motorcycle enthusiast. In addition to his parents, he was preceded in death by brothers, Bob, Frank, Steven, and John Stoetzel and sister, Geri Stoetzel. He is survived by children, Angela (Travis) Moore of Leesville, SC, Kelly Blume of Augusta, GA and Nathan (Mary Catherine) Drake of Knoxville; brothers, Jim (Vickie) Stoetzel of Oliver Springs, David (Sara) Stoetzel of Oak Ridge, and Michael (Janice) Stoetzel of Murfreesboro; sisters, Kathy (Eric) Reynolds of Oak Ridge, Marlene (J.D.) Mayton of Coalfield, Mary (Jeff) Brooks of Oak Ridge and Judi (Phil) Seeley of Jupiter, FL; grandchildren, Brittany, Corey, Tyler, Gabriel, Toria, Jacob, and Nicholas; great-Grandchildren, Dehlila, Alivia, Remington, Madilyn, and Emma; uncle Wayne Groppe of Oak Ridge, aunt Ruth Kornell, Madison, WI, and special friend, Sharon Nelson-Inklebarger of Knoxville. The family will receive friends on Saturday, January 19, 2019 from 10am – 12pm at Weatherford Mortuary. Family and friends will meet for a graveside service at 12:30pm at Oak Ridge Memorial Park. The family asks that any memorials be made to St. Jude Children’s Research Hospital, PO Box 1000 Dept 142, Memphis, TN 38101-9908. An online guestbook can be signed at www.weatherfordmortuary.com. To send flowers or a remembrance gift to the family of Daniel "Stet" Wayne Stoetzel, please visit our Tribute Store. Meet at the graveside in the Garden of Tranquility. "Email Address" would like to share the life celebration of Daniel "Stet" Wayne Stoetzel. Click on the "link" to go to share a favorite memory or leave a condolence message for the family.